There are no desserts easier to make than fuss-free no bake recipes. Perfect any time of year, these toothsome treats will become your family’s favorite with each savory bite. From decadent dessert bars, to luscious pies, there are a variety of no bake easy desserts in this eCookbook that will be considered blue ribbon winners. 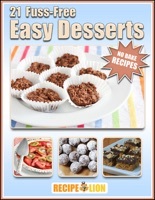 If you don't have time to make an elegant dessert recipe for a potluck or just for a quiet night at home with the kids, our free eCookbook will provide you with some great treats that you will not be able to resist. So, if you can't imagine a night without a dessert following a hearty meal, check out one of these wonderful no bake recipes.